Dirt-happy racers love to use the phrase “press on regardless,” but the inaugural Americas Rallycross event whipped out an epic display of that mantra in practice thanks to Timo Scheider. Scheider’s hood flopped up and blocked most of his windshield during most of one race, but did that stop him? Nah. Americas Rallycross—the place where many ex-Global Rallycross teams ended up this year—held its first-ever event not in America, but at Silverstone, in the United Kingdom. 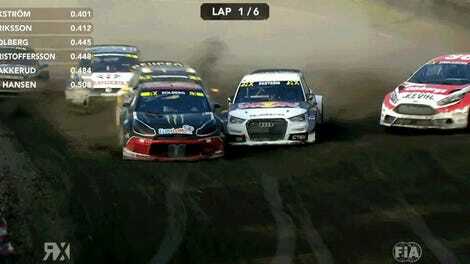 The most stunning drive wasn’t from an ex-GRC guy, but rather, from two-time DTM champ Timo Scheider. Scheider retired from DTM in 2016 and has been dabbling in World Rallycross ever since. For this year, though, he’s doing the Americas Rallycross series in a Seat Ibiza—a car which hilariously isn’t sold in America, but to be honest, I don’t care about that as long as I see it sideways and covered in dirt. During the second lap of the second qualifying race at Silverstone, Scheider’s hood completely flopped open. Did he give up, though? Did this stop him? No! Nothing is over until Timo decides it is! After the round, Scheider told ARX’s commentators that he noticed that the hood was loose on the first lap, but was really hoping it wouldn’t pop open all the way. So much for hoping. So, then Scheider focused his hope-power—such that it is—on hoping that the hood would flop back down as it was really hindering his ability to see turn-in and braking points. No such luck. Scheider kept going for the rest of the four-lap qualifier with his hood completely flopped over his windshield. Best of all, Scheider somehow managed to finish second despite that. 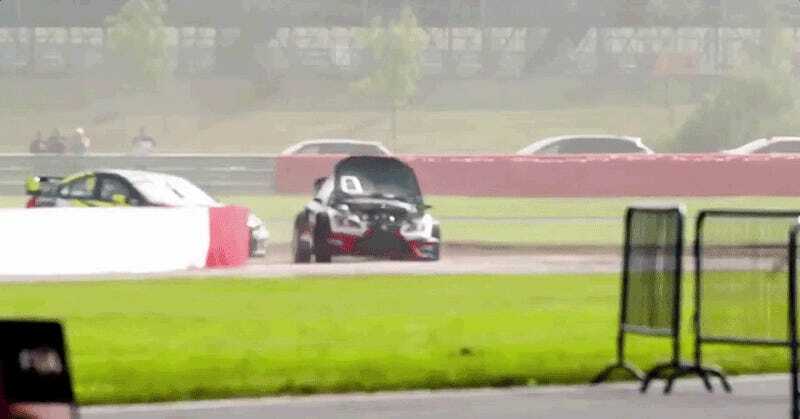 He was even leading with his hood up until he had to take a “joker” lap—a slightly longer course that rallycross drivers have to take at least once per race. Subaru driver Patrik Sandell ended up passing Scheider for the lead while Scheider was taking his joker lap on lap 4. Just look at this madness. Sadly, the livestream of the ARX race was pulled shortly after the race as the series has a broadcast deal with CBS Sports to show highlights from the races Wednesday at 10:00 p.m. ET, so there’s only a brief clip of Scheider’s insane run online at the moment in ARX’s promo reel from the weekend, but that brief clip and the photos explain it all, really. Scheider wasn’t the only insane unstoppable driver over the weekend. Subaru driver Chris Atkinson clipped the tires inside a turn rolled over during the third qualifying race, but thankfully landed on his wheels. His car still ran after all of that, so of course he kept going to finish the race. Volkswagen driver Tanner Foust ultimately won the inaugural event overall this weekend. Yes, the ex-GRC Beetles are still fast—although it looks like they’ll at least have a tougher time running away from the rest of the field this year. UPDATE [6/1]: There’s a longer clip of Timo’s hood-up hijinks up now that you should savor with every part of your now-confused brain.